Ben Balistreri: Randy the Ram "The Wrestler"
Randy the Ram "The Wrestler"
So before Christmas my buddy and fellow board artist, John Puglisi, asked if I wanted to go to a free screening of "The Wrestler". Turns out it was the actual premier of the film in Beverly Hills! I just about barfed with glee when Rowdy Roddy Piper, Brutus the Barber Beeefcake, Greg the Hammer Valentine, and even Nature Boy Rick Flair were introduced before the screening. I could name drop all night but the highlight was seeing Slash chilling by the free bar. 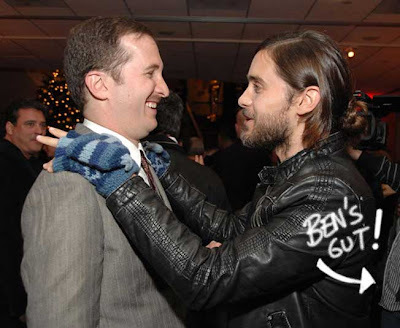 To prove my story here's a photo of the films director Darren Aronofsky and Jared Leto at the after party. You can clearly see my gut on the right side of the photo. I also did a quick drawing of Randy the Ram in case anyone wants to make an animated version of the film ala "Hulk Hogan's Rock-n-Wrestling." Just kidding. OK... No I'm not. 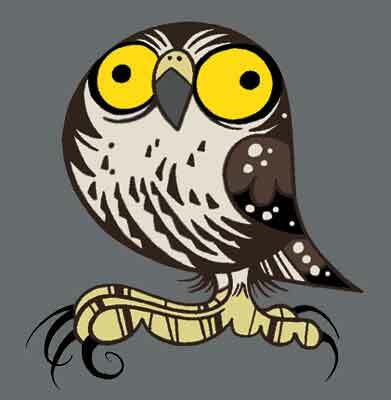 I LOVE the way you draw him! It's perfect!! very nice. Instead of posting on the older posts, this comment is for this post and the recent stuff posted. This stuff looks great. Your variances of shapes is pleasing to the eye. Nice one, Ben. I enjoy the simplicity of the design. Awesome! I would watch that cartoon until I died. So did you like the film Ben? Just saw the film myself. It was pretty damn good. Mickey was channeling his past for sure. Rad design Ben! haha!! WIcked! Great great drawing too dude! That’s fantastic, his face is excellent. Funny ! : first time I went to work in LA, back in 1985, was to do some model-sheets for "Hulk Hogan Rock 'n Wrestling". That was a new world for me ! Freakin' awesome dude!! I can't wait for this movie!! So cool you got to see all those old school wrestlers!! love the that drawing!..u nailed Mickey. Cool news Ben. That must have been a great experience. That movie was so weighted and amazing. Ben ,Your head must have exploded. 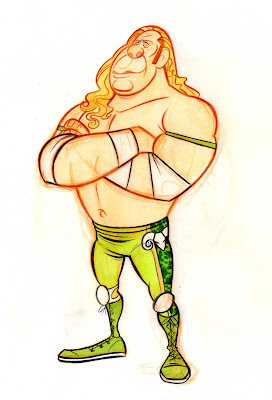 The Wrestler is awesome and your drawing is AWESOMER!! !I would work on that film in a minute! RAAAAM JAAAAAAAAAAAAAAAM!!!! Sweet drawing! Looks like a fun screening.